Javanese Shadow Puppets is one of the art traditions that grow and develop in Java society. More than just a show, this who often called “wayang kulit” was used as a medium for reflection toward the spiritual spirit of the gods. The word of “wayang” comes from the word “ma Hyang”, which means the spirituality of the power. However, there are also people who say “wayang” comes from a performance technique that relies on shadow (shadow / puppet) on the screen. Wayang kulit is also a wealth of Indonesia that was born from indigenous culture of Indonesian people who love art. To know more about that, you could read these facts of Javanese Shadow Puppets that is very interesting. 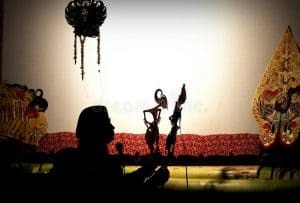 UNESCO on November 7, 2003 has stated that Javanese shadow puppet is a world cultural heritage that COMES FROM INDONESIA. State Minister of Culture and Tourism I Gede Ardika revealed, since 7 November 2003 the United Nations Educational, Scientific and Cultural Organization (UNESCO) has recognized the puppet as World Master Piece of Oral and Intangible Heritage of Humanity. Stories in wayang is vary greatly. In general, the Dalang (the puppeteer in Javanese a shadow puppet) brought a story which is not far from history. If you are confused by the story, then you should come early. Usually the dalang will give a synopsis of the story at the opening. The story that will be presented in the puppet always gives the impression and different message to the audience. Not infrequently the audience should be able to take the lessons of what is shown in the wayang kulit story. A Dalang can always portray the various roles and characters of each puppet. Do not be surprised if the Dalang’s voice changes like a woman, or even turns into a big and splash like a giant. In a series of stories brought the dalang ready to play all the characters involved in it. It is like dubbing in film-fim cartoon. The difference, this leather puppet dubber is only filled by the voice of a dalang by changing his voice. It was cool. In the middle when the Dalang brings a story, sometimes you will also hear a joke from him. This is what makes the atmosphere becomes broken by laughter from the audience. Comedy and humor deliberately inserted in the middle of the story so the audience is not so tense when listening to the story Shadow puppets. The scenes give its own color in the Javanese shadow pupppet performance. If you are watching a Javanese shadow puppet show, the accompaniment of Javanese music must be heard. The sound of kenong, until the gong sounded in beautiful harmony The sounds produced from these copper-made instruments emit a distinctive sound that other instruments do not have. Meanwhile the hands of the musicians are seen very skilled in choosing a tone. The shadow puppet performances usually last in all night long. Have you ever thought about the stamina of the player, especially the musicians? They remain focused to accompany the puppet shadow performance. The beatings they do still produce a harmonious tone. You can imagine how great their power to accompany the shadow puppet. Wayang Kulit is one of indigenous culture of Indonesia. This traditional art is growing on the island of Java. Javanese scholars known as Wali Songo perform da’wah and syiar Islam through Wayang Kulit show. Formerly the method of spreading Islam religion using wayang kulit. In the shadow puppet show, the Wali Songo insert Islamic values so that many Indonesians are interested in embracing Islam. In a Javanese puppet shadow show, the presence of powerful puppet figures who can perform skills beyond man is an obligation. For example, Bagawan Bagaspati with the magic of Ajian Chandrabirawa who can not die except from his own will. There are also Antasena figures who have the magic of flying, get into the ground and also dive into the water. With the heritage of Cupu Madusena, Antasena is also able to revive the dead Pandavas. Although not sensible, but his presence is always awaited by the audience. In addition to the magic figures, some magical weapons and heirlooms can also be found in the wayang kulit show. For example Pancanaka nails which became one of the heirlooms that form the thumbnail of the hand that is long, strong, and very sharp. With this heirloom the puppet characters can make opponents helpless. There is also the heirloom of a powerful Konta Spear destroying the opponent as ever performed by Duke Karna to defeat Gatot Kaca. On September 4-5, 2004, Ki Manteb made a record with performing 24 hours nonstop with the play of Baratayudha. The show was held at RRI Semarang, Jalan A. Yani 144-146 Semarang. Thanks to this performance, he earned MURI record for longest shadow puppet performance. And incredibly, despite having been basting for 24 hours, the doctor who examined Ki Manteb’s health after performing stated that Ki Manteb’s condition is excellent. In Indonesia today, not a few high school classrooms that teach science to become a Dalang or puppeteer. For example, Department of Pedalangan Sekolah Tinggi Seni Indonesia Surakarta (STSI) is now so (now the Indonesian Art Institute of Surakarta). Graduates of this school not only can play the puppets, but also broad-minded and critical thinking. From the university was born a puppeteer who is not descendant of the world of wayang but has extraordinary intentions. There are many numbers of foreigner that are interested to learn and study about Javanese puppet shadow. One of them is an Australian woman named Helen Pausacker who studied the world of wayang more than 40 years old. Coming from a sense of love, Helen decided to explore the science of tradition that he loved it. Until finally he managed to become a professional dalang. Many stories he has brought, ranging from Mahabharata to Ramayana. Night will feel alive if you miss it by looking at wayang kulit. The rhythmic gamelan rhythms combined with the melodious sound of the sinden will not let you fall in drowsiness. The story that the dalang brings will bring you late into joining one of the characters in the story that was delivered. You will soon realize how great Javanese culture is in the past. Wayang kulit is a performance art that has been more than half a millennium. Its emergence has its own story, related to the entry of Javanese Islam. One of the Wali Songo members created it by adopting the Beber Wayang that developed during the heyday of Hindu-Buddhism. Adoption is done because wayang already terlanjur with the Javanese so that the right media for propagation spread Islam, while Islam forbids the form of art. As a result, created shadow puppets where people can only see the shadow. The characters in the whole puppet numbered in the hundreds. The scarecrow is placed on the edge of a white screen or commonly called a geber plugged in a banana stick that is near the Dalang. When played, the puppets will appear as a shadow on the white screen in front of the Dalang. The shadow can be created because every puppet show uses an oil lamp as a lighting that helps the reflection of the puppets being played. Those are the facts of Javanese Shadow Puppets. Story of puppets shadow always teach noble minds, love each other and respect, while sometimes show social criticism and funny role through comedy scene puppet. It is exactly right that UNESCO recognizes it as a legacy of Indonesia’s cultural treasures worthy of dignity.